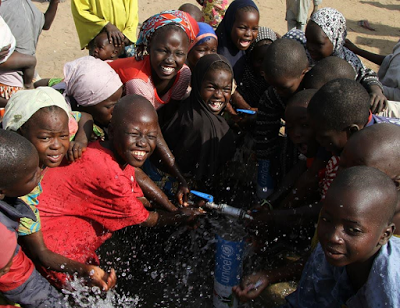 Some children are pictured celebrating easy access to water source in Dalori camp near Maiduguri as UNICEF recently rehabilitated borehole pumps water directly into their camp. Life is a little bit easier because they no longer have to trek long distances to fetch water from a pond. The solar powered pump with 10,000 litres overhead storage tank will serve well over 3,000 internally displaced persons in the camp. Suleiman Bukar, a community member, thanked the United States Agency for International Development for providing funds to support this project which provides potable water to them.